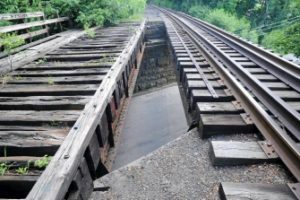 A railroad trestle in Wilkes-Barre PA is a public safety hazard that has killed one person and left another person severely injured, according to a wrongful death lawsuit filed in Luzerne County PA this week. The trestle crosses over East Thomas St. at South Cleveland St. in Wilkes Barre, and has a large gap between a set of current and former railroad tracks that is a major hazard, according to the lawsuit. That is where a 29 year-old man died last year. He was riding his dirt bike through the opening at 2 am on April 26, 2015 and fell 20 feet to the ground and died. The owners and operators of the bridge had known it was hazardous since May 2014, when an ATV rider also fell through the hole and suffered serious injuries. Attorneys representing the widow and her daughter filed the suit against the owner of the trestle, the Luzerne County Redevelopment Authority and Luzerne County Rail Corp. 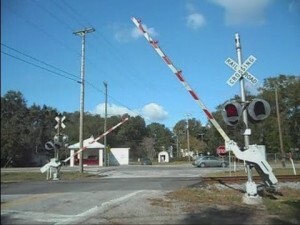 The attorneys stated that the defendants did not take any action after the first accident to restrict or impede the public from using the railroad right of way, as well as the trestle. Fatalities on train tracks and train trestles are far too common, but in our work as railroad accident lawyers, we find that railroads often delay or fight important safety upgrades to save money. We have seen railroads hesitate to spend money on fences, No Trespassing signs, systems that would allow dispatchers to slow or stop trains and more. We advise all railroads to do more to control track access and to improve protections on train trestles for people who live and work near them. People whose loved ones have died at or near train tracks such as in the above tragedy should talk to a personal injury attorney to determine if the railroad may be held liable.